As many of us already know, the monk is an underestimated class, but this preconception ends up eliminating the fact that each player can create their own opportunities, but I can’t disagree that the Monk certainly needs more love. After playing a few weeks as Monk and some theorycraft, I can say that I found my main class on Skyforge, and I want to use this guide to show the way that I did to discover this. I will try to keep this guide as a general explanation of the Monk, I will discuss his talents and attributes. Initially I opted by not creating individual sections for PvE or PvP but in the future I will be creating specializations for this guide, based only on my perspective. A monk must have the serenity to accept the things he cannot change, the courage to change the things he can, and the wisdom to know the difference. 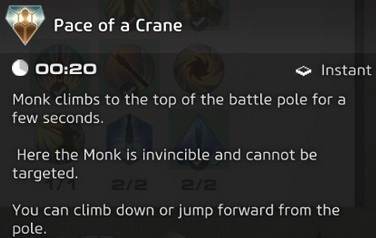 In this section I will show you the description of the monk skills and stances. 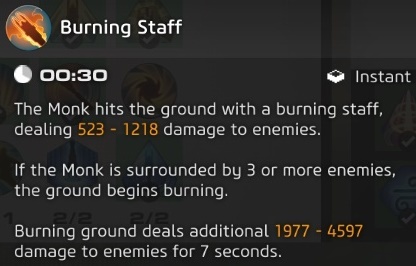 We have 3 stances as monk: Earth, Fire and Wind, and each stance has their own abilities set. 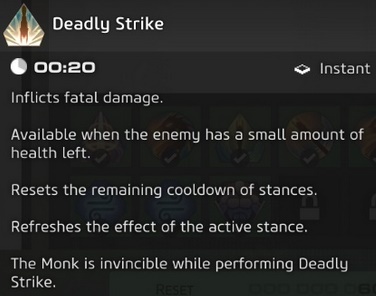 Before proceeding, know that we as monk we need to be always switching stances to keep the balance during the fight, due to an unique effect that each stance gives us for 10 seconds each one. The Earth Stance is the stance that you will use to do damage ‘mostly’ against a single target, control the fight when necessary and use as damage mitigation thanks to the “Stone Skin” effect. Upon activation, the Earth Stance will trigger the effect “Power of Earth” for 10 seconds. – Power of Earth : The main effect here is the application of Hidden Trauma to the target of your first combo finished under effect of Power of Earth. – “Hidden Trauma” will have the same damage as your base damage, if it’s 436 – 918, your Hidden Trauma damage will float between these numbers ‘436 – 918’. 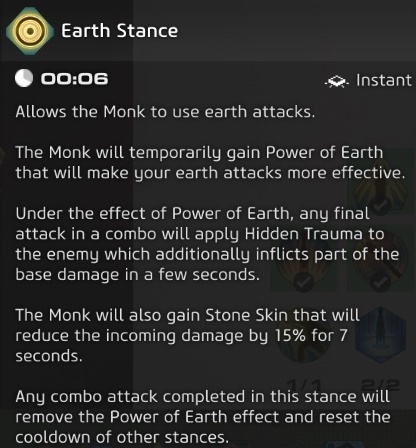 – Stone Skin : Upon activation of the Earth Stance, the monk will receive a buff to reduce damage taken, it’s always good to keep this buff up as often as you can. Use this ability to CC enemies in a short range in front of you. Single target ability, very strong if used while you have impulse charge available. Each stance will have 3 unique basic attacks [LMB]. The third basic attack will count as combo finisher. ‘Falling Mountain’ does moderate amount of damage and activates Impulse Charge if available. ‘Dragon Strike’ will stun the enemy for 2,5 seconds if the monk is under effect of “Power of Earth”. Activates Impulse Charge. ‘Dragon Strike’ is the best recurrent single target CC to use in a fast way. ‘Lotus Strike’ will stun only the nearby enemies and the main target will be knocked back. Great ability to area control. Remaining in the Earth stance and using one more time your basic attack (LMB) the monk will leap towards his main target. 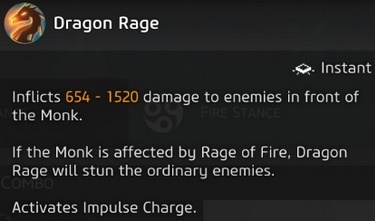 Rage of Fire : lasts for 10 seconds or until the first combo is out, boosting in 43% your final damage. This is not your best AoE ability but can be useful against a pack of weak enemies. Use against 3 or more enemies to create the Damage over Time effect in the impact area. Does moderate amount of AoE damage. 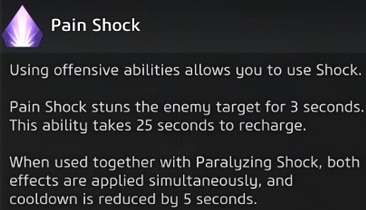 This ability can be useful as an recurrent AoE CC. The large AoE will make you prefer to use this ability to easily clear hordes of enemies. Does a moderate damage to enemies surrounding. Certain talents can make this ability a better option. The Wind Stance will give you the mobility and utility that you need sacrificing a considerable amount of damage. 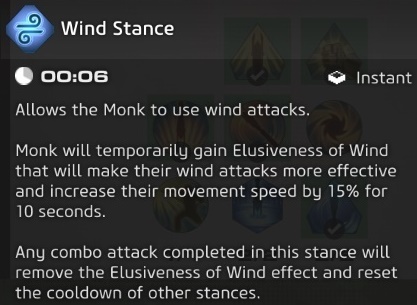 Elusiveness of Wind : Helps you to position yourself while the 15% movement speed is active and slightly increases the damage of the first combo finished under this effect. ‘Wind Catcher’ is an ability that you will want to save to move away when things get complicated. The invulnerability or the movement speed are nothing compared to your 3 times Dash distance, having some Dash charges ready can be useful to use this ability. This combo is not as applicable as your basic attacks from the other stances, since it has a low final damage in comparison. 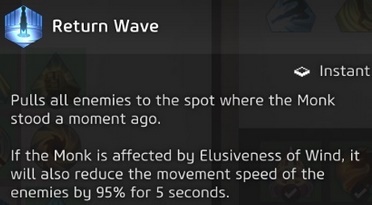 You can use ‘Return Wave’ to prepare your enemies to the slaughter. Pulling all enemies around to your position and making them almost immobile if the monk is under the ‘Elusiveness of Wind’ effect, can be a great way to position a pack of mobs for your team. You can use this ability as the same concept from ‘Wind Catcher’, use to increase the gap between you and your target to get a better positioning on the fight or just to move away from there, if you are under the ‘Elusiveness of Wind’ effect this ability can be a safer option than ‘Wind Catcher’ thanks to the invulnerability. Use this ability to avoid some strong blows, or to seek an opportunity to get away from the fight. If you press [Z] again you’ll climb down, if you press [Space Bar] the monk will jump forward. Fusion Strike deals an total damage over 3 attacks, these attacks will hit every enemy in front of you knocking them back. In my opinion, it is a very weak ability if you are fighting a single target, so try to save this ultimate to use against a lot of enemies. Spirit Monks or Impulse based Monks, as far as I could test, apparently can get a slight vantage on their damage in comparison to Luck Monks or Critical based Monks. This is because of the vast amount of opportunities that the monk finds to use blows and abilities benefiting from the Impulse Charges, e.g., our main combo finishers: Falling Mountain, Dragon Strike, Lotus Strike, Dragon Rage, Spiral Attack, Enraged Harpy. Although I have come to this conclusion, I still encourage you to test a luck and critical based monk. Therefore, we will have Strength and Spirit as main stats. Strength: Increases minimum base damage. Impulse Damage: Bonus damage inflicted by skills that use Impulse Charge. Derived from Spirit and Discharge Recovery. 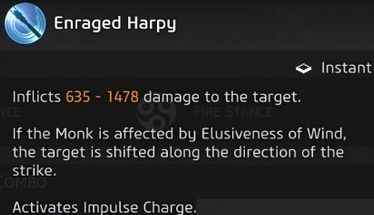 Discharge Recovery (max 40%): Increases the frequency of Impulse Charges and the amount of impulse damage. Pairs effectively with Spirit. Accuracy (max 100%): Brings the minimum base damage closer to the maximum and increases your Strength’s influence on the base damage. Crushing Blow (max 25%): Has a certain chance to increase base damage two times. Solidity (max 25%): Increases Might by a certain percent of your Stamina. I recommend that you use your chapels according to this priority. I will first list every Monk talent and then list their priorities. -(Knockout Punches) – Duration of stun caused by Aggressive Lunge and Dragon Strike is increased by 2 seconds. – (Rock to the Head) – Falling Mountain deals 200% more damage to stunned enemies. – (Ligament Injury) – Basic attacks in any stance slow the target down by 70% for 4 seconds. – (Major Bruises) – Hidden Trauma caused by earth attacks deals additional 150% damage. 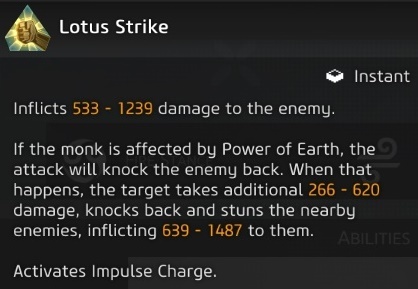 – (Stone Technique) – Lotus Strike deals 50% more damage to targets with more than 30% health. Falling Mountain inflicts 40% more damage to targets with less than 30% health. – (Painful Impact) – Distance the target is knocked back by Lotus Strike is increased by 10 yards. If the target of Lotus Strike hits a stationary obstacle, it will be stunned tor 3 seconds. – (Sear) – Rage of Fire increases damage by 61% instead of 43%. – (Technique Mastery) – For each pack monster killed by the Monk, the cooldown Of Stone palm, Burning Staff, and Wind Catcher is reduced by 0.5 seconds, for each ordinary monster – by 2 seconds, and for each elite monster or boss – by 15 seconds. – (Rampage of Fire) – Dragon Rage and Scorching Strike inflict 110 more damage to slowed and immobilized enemies in PVP. – (Mighty Onslaught) – Spiral Attack deals 65% more damage to enemies with more than 50% health. – (Gusty Wind) – Dragon Rage removes effects caused by earth attacks that deal damage over time, inflicting the damage they would otherwise have dealt, as well as inflicts additional 70% of damage. – (Fan Swing) – In the second second Of its duration, Scorching Strike spreads Hidden Trauma caused by earth attacks from effected enemies to two more enemies in a 8 yard radius. – (Air Barrier) – Elusiveness of Wind reduces the duration of control effects by 70%. – (Light as Feather) – Range Of Rapid Stream is increased by 10 yards, and its damage is increased by 50% when Impulse Charge is activated. – (Update) – Switching to Air Stance removes all control effects and other removable effects from the Monk. – (Perishing Wind) – Slowing effect of Return Wave lasts 2 times longer. – (Powerful Gust) – When Elusiveness of Wind is active, the first Rapid Stream used from 25 or more yards away, stuns the target for 3 seconds. – (Air Shield) – When used 15 or more yards away, first Rapid Stream used during the Elusiveness of Wind gives the Monk a shield that absorbs damage equal to 18% of their health. Duration: 7 seconds. – (Hardened Warrior) – Deadly Strike has a 90% chance to get instantly restored. Let’s talk about your talents priority on your “Fists of Impulse Monk”. Keep in mind that this is my opinion, feel free to play around and change what’s necessary to your play style. I mentioned this on the Introduction, but i’m gonna say again: I’m not doing a specific guide to PvP or PvE, but I can start working on specializations guide next week. Hidden Trauma from the ‘Power of Earth’ effect, is one of your abilities that will provide a noticeable boost to your final damage, and thanks to your Accuracy stacking after Discharge recovery, you can close the gap between your base minimum and maximum damage to increase your Hidden Trauma damage, and since it’s pretty easy to finish any combo on your earth stance I highly recommend the use of Major Bruises talent to increase your hidden trauma damage. In addition to that I recommend the use of your ‘Dragon Rage’ ability using the Gusty Wind talent, after applying Hidden Trauma to your target to significantly increase your damage. 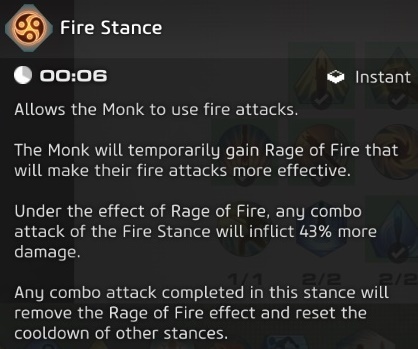 We can still try to boost our damage of the Fire Stance using the Sear talent, which increases our damage by 61% instead of 43%. Another great benefit from the ‘Power of Earth’ effect is certainly Stone Skin, which can become even better if the Diamond Dust talent is equipped, increasing your damage reduction from 15% to 30% for 7 seconds. These 4 talents are a must regardless of the situation, in my perspective. All the other talents depend entirely on your playing style, so feel free to do your tests. If you decide to play as a control monk using your Aggressive Lunge, Dragon Strike, Lotus Strike, Return Wave and Dragon Rage abilities, I encourage you to take talents such as Knockout Punches to increase your Dragon Strike to 4,5 seconds, Ligament Injury to slow down your enemies on each attack, Ligament Injury is also highly recommended for PvP since you can get the Rampage of Fire talent to increase your Dragon Rage damage against slowed enemies, and if you need an additional control on your gap closer you can use Powerful Gust talent. 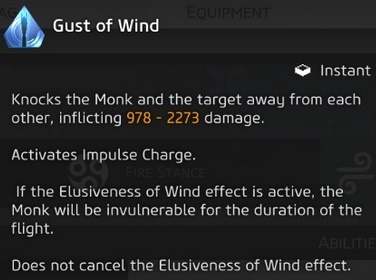 If you are having trouble to stay alive or being controlled in some situations, you can always use Air Barrier and Update talents to reduce or remove all control effects on the monk upon activation of the Wind Stance, so you will need to switch more often to the Wind Stance. Air Shield can also give you some edge in combat when you have enough range to use Rapid Stream, be sure to be 15 yards away from your target otherwise the shield is not activated. 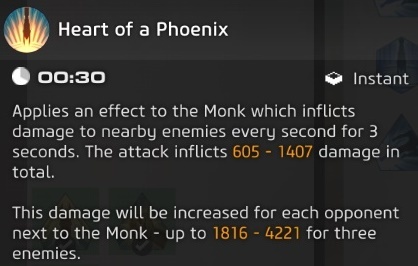 If you want to get the best of your AoE damage, consider using Heart of a Phoenix, Scorching Strike and Spiral Attack on your Fire Stance. You can than combine some useful talents such as Fan Swing to spread Hidden Trauma to other 2 targets, Technique Master to make you pop Burning Staff ability more often, Mighty Onslaught can also be great at the start of a fight as Spiral Attack applies Impulse damage to the enemies around you, if you’re using the ‘Painful Spams’ symbol the damage can be even better (topic 4.6). 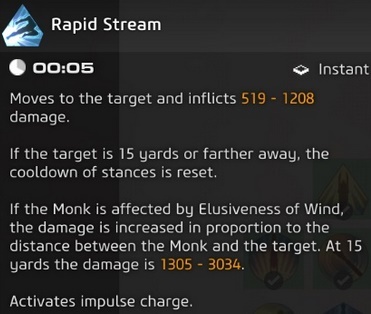 You will want to get some symbols on this list as soon as possible to be noticeably the increase in your damage as an impulse monk. Double Discharge gives you 12/24/36% chance to activate a second Impulse Charge, very useful to monks. Prioritizing Discharge Recovery makes Double Discharge proc more often. 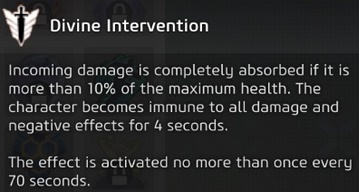 Apply an 3 seconds effect on your target that deals your total Spirit as damage over time. Painful Spasms has a good synergy with Double Discharge. Essential to increase your base damage. Very important to make the best use of your Impulse Charges. 4 seconds immunity every 70 seconds… Why not? All those impulse charges that you will be getting will keep your damage high for 6 seconds longer. The monk can do a pretty good control, take the opportunity to do some damage. Pain Shock and Paralyzing Shock are both required to increase your control, this symbol is not on the top of the list because you will only get it as you progress trough the Atlas. This alchemist symbol can boost your damage even more for 10 seconds, any dps class would love to have this. The archer symbol can be classified as optional, but 15% additional damage at the start of any fight can give you a great edge. If you have 2 empty slots and some extra sparks to get these, it could be worth. The monk can be a very versatile class, which makes it fun to play as one, you just need to adapt to him which can be a little hard at first as it is to every class. Related to what everyone says about the monk’s damage, I believe he has a moderate damage in exchange for his control, which is great. Do not expect it to be the perfect class because it is not, it has its flaws, as you need to use a dash to cancel some combos for example, or his basic attacks that doesn’t follow the target as it happens to the paladin or the slayer, which forces the monk to always be close to the target to get some damage done otherwise you can lose an entire combo. These are things that could be corrected but you can still get used to it. At the end of the day you can have a really good time with this class. Just like me. I hope this guide has been helpful to you, as I try to explain my perspective from playing as monk. Any feedback is welcome, I’ll try to use your feedback as improvements. Is there a rotation that you use & that you could share as example? so which main hand and offhand monk should use?